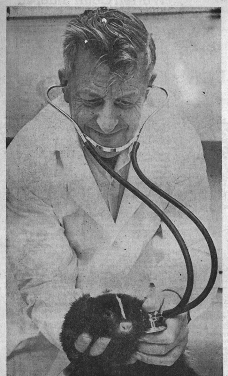 Over his 65-year career Dr. Matthew “Doc” Maberry gave mouth-to-blowhole resuscitation to a whale, contracted a potentially deadly virus from an African green monkey and herded elephants and other wild beasts through Portland's Washington Park. 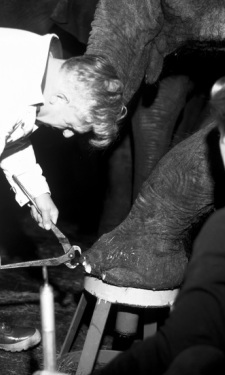 In 1958, he became the first full-time zoo veterinarian at Portland’s Zoological Gardens, now the Oregon Zoo and was present, in 1962, for the birth of Packy, the famous old man of the Oregon Zoo's pachyderm herd and then the first elephant born in North America in 44 years. Maberry was part of a team working to design new facilities that would provide elephants with much more freedom than was common in zoos at the time. These facilities, built in 1960, allowed for normal social interactions and natural breeding among the elephants. Additionally, at a time when little was known about elephant pregnancy and maternal behavior, Maberry modified medical equipment and hormonal tests originally developed for humans, to monitor the fetal heartbeat. His work with Packy and other elephants in his care has been instrumental in shaping wildlife conservation efforts, developing captive-breeding facilities, and enabling zoo professionals to better understand the nature and complexity of Asian elephants. “Dr. Maberry’s work helped provide the foundation on which we’ve built today’s elephant-care programs,” said Mike Keele, Oregon Zoo director of elephant habitats in an article written for Doctor Maberry's memorial. To honor his work Doc Maberry was recognized with lifetime achievement awards from the Oregon Veterinary Medical Association, Metro Council and Washington State University.